Why not make your SelBuk system even more complete ? By adding the use of a printer, you can speed up your processes even more. We invite you to browse though the list of available for use with SelBuk systems. 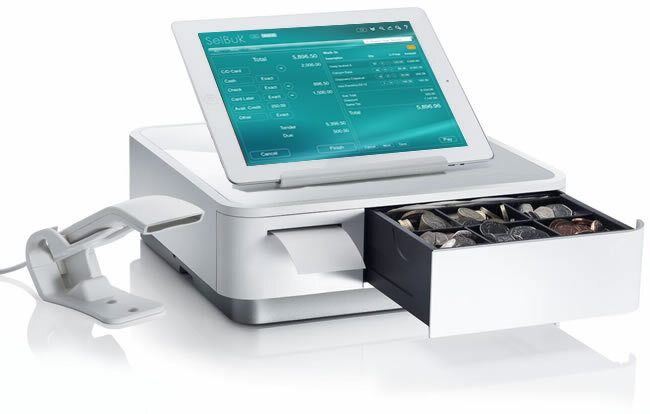 Star Micronics' mPOP™, Mobile Point of Purchase with convenient Bluetooth and USB connectivity; this compact, stylish, yet fully integrated peripheral is an ideal solution for tablet and mobile device based POS system. Simply connect your preferred tablet or mobile device of choice and the mPOP™ transforms into a fully integrated POS system. The mPOP™ combines a two-inch thermal receipt printer with "Drop-In and Print" paper loading and a compact cash drawer with 4 bill and adjustable 6 or 8 coin slots. Star Micronics is proud to introduce the SM-L300, 3-inch portable printer. This addition to the SM-L series of Bluetooth low energy portable printers allows users to connect to any Apple iPad, iPhone, or iPod touch, iOS BLE compatible device without having to pair to it. With no limitation on the number of devices connected, BLE is the perfect solution for any environment using multiple devices for mPOS printing. In addition, it requires no certification or prior authorization from your iOS application. The SM-L300 is Bluetooth (3.0/4.0) compatible with all operating systems including Windows, Android, and iOS. The mobile printer’s BLE technology results in lower power consumption, and be conveniently charged anytime, anywhere, using included USB charging cable or optional cradle charger. The SM-T300i has easy drop-in-and -print paper loading, a reliable and quick print speed of 75mm per second, and an intuitive LCD display. Dust protected and splash-proof resistant (IP54 Certified), the SM-T300i is rugged enough for outside field workers requiring handhelds to seamlessly print from a mobile device to a durable portable printer. One attribute that will grab your attention is the TSP650II BTi’s lightening fast print speed. Capable of printing 60 receipts per minute (300mm/sec), the TSP650II BTi offers unrivalled processing power and outstanding data throughput. Equipped with easy “drop in and print” paper loading, small footprint and reliable guillotine cutter, the TSP650II BTi is a welcomed addition to any POS system. The SM-T400i has easy drop-in-and -print paper loading, a reliable and quick print speed of 80 mm per second, and an intuitive LCD display. Dust protected and splash-proof resistant (IP54 Certified), the SM-T400i is rugged enough for outside field workers requiring handhelds to seamlessly print from a mobile device to a durable portable printer.